In addition to our other services, we offer a weekly Kinetics Class. Kinetics is a class designed to help your dog build core muscular strength and balance, allowing your dog to use itself at maximal potential. The classes provide mental stimulation and are physically tiring, as the dog is asked to use muscles they may not be used to using. The class involves balance exercises, which promote co-ordination, spatial awareness and deep muscle strengthening. The class does not involve obedience or agility, however it does help to build an understanding relationship by teaching the dog to calmly engage in exercises that it doesn’t usually get asked to do. 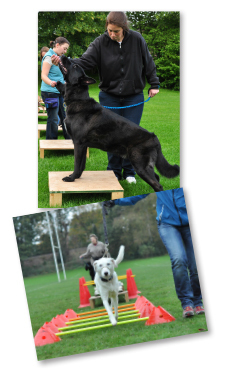 Why not ask a member of the Therapaws staff for more information on kinetics classes and how they might help your dog?